We all live in the world, but it’s our world that really matters to us. To that end, digital signage is developing along with geotargeting and big data to provide more consistent marketing. But it’s also shaping personalized experiences—and in 2016’s customer-centric market, those experiences are what separate the thought leaders from the followers. From the time digital signage first hit the market, it pioneered the landscape of responsive advertising and made businesses reimagine their signage efforts. Many companies were quick to realize the potential digital signage had to make a personal connection with a customer. Using real-time cameras and sensors, digital signage could react with users to create an individualized experience—promoting user engagement and ultimately influencing purchases. Now, with new geotargeting technologies, digital signage has taken relevancy to a whole new level. My personal favorite example of geotargeting in digital signage is a UK company’s brilliant ad campaign for pet adoption, in which a digital dog follows consumers around a mall on signage to convince them to adopt a shelter pet. How it worked: The company handed out flyers with paper-thin electronic chips to shoppers. The chips would send a signal to sensors within the digital signage as shoppers passed a screen, triggering the dog to appear and “follow” the person. Responsive digital signage like this promotes customer engagement and leaves a distinct impression. Customers remember personally interactive digital signage and are thus more likely to follow through on a call to action. And now that digital signage has the ability to track persistent targeted information, the possibilities for user engagement are endless. Relevancy is at the heart of all customer-centric marketing. If your ad isn’t relevant to your target audience, there is no reason to pay attention. Just as mobile phones connect us to people and information wherever we go, digital signage possesses the power to connect people to your brand. Persistent ads and ad retargeting are only the beginning of creating a dynamic customer experience—and digital signage just may be the next mobile connection. It’s not enough to make people aware of your brand through digital signage. They need to experience your brand through some kind of immersive or interactive event. 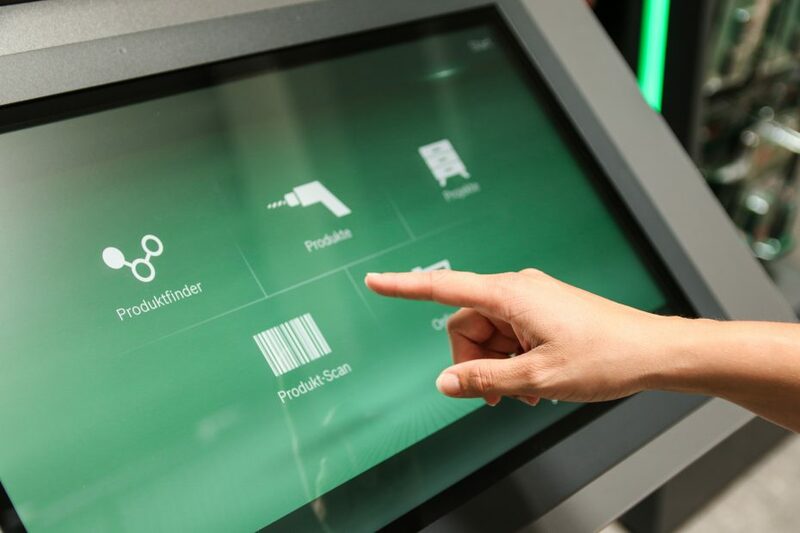 With the advent of new digital signage technologies like geotargeting and increased mobility, companies can truly give customers a more personal experience as they shop. Digital signage has the advantage of collecting big data concerning real-time consumer activity and using it to change marketing efforts immediately. Mobile integration into digital signage is therefore the next step for technology. A couple of years back, I mentioned the struggle some businesses encountered in being unable to adequately measure ROI, and their fear that it wouldn’t be worth it. But with the marriage of mobility and digital signage, those fears are finally laid to rest. As of just last year, 64 percent of American adults owned a smartphone. This number doesn’t even account for the next generation of consumers. Currently, 92 percent of teenagers go online at least daily. With these numbers, it just makes sense that the tech industry would eventually combine mobility with digital signage. Next-generation mobility will put digital signage in user’s hands, and customers will be able to control the digital sign’s content using their personal devices. I foresee digital signage and mobility combining in bi-directional outlets: Not only will the user control what appears on a digital sign, information on a digital sign will be sent to a customer’s smartphone. Discount offers, time-sensitive promotions, website links, social media posts, and more from the company will all appear on a user’s phone as they pass the digital signage—creating a perfect marketing marriage of relevancy and immediacy. The goal of any new type of marketing trend is to enhance customers’ experiences with a brand. The partnership of targeted information and digital signage can do just that: create a personal, individualized experience for customers. Targeted customer information holds greater benefits to companies than more general big data. In fact, someone who knew what he was talking about once said that customer experience is the future of marketing. Targeted information gives a business the opportunity to aim digital signage marketing at a specific audience, optimizing the success of the advertisement. While spreading brand awareness to as many people as possible is the goal, if you aren’t targeting the right kind of people, it won’t matter. Sending an ad to a grandmother about short-shorts that are on fleek gains nothing. Targeting the right people at the right time is what closes a sale—and combining targeted information with digital signage is a smart way to make this happen.